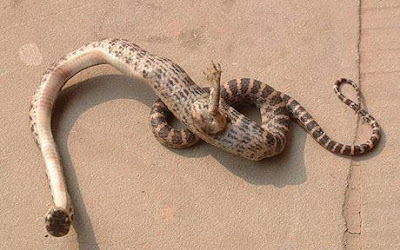 Okay, so a snake with a foot (above) was discovered in China recently. Sixty-six-year-old Mrs. Duan, who lives in the town of Suining, was sleeping soundly when, she says, "I woke up and heard a strange scratching sound. I turned on the light and saw this monster working its way along the wall using his claw." Let's stop for a moment. Go ahead and oooh or ahhh or scream in terror (depending on how you feel about snakes with feet). That isn't the point of this post. The point is what happened next. According to this story, "Mrs Duan said she was so scared she grabbed a shoe and beat the snake to death before preserving its body in a bottle of alcohol." Why? The "terrifying" snake was sixteen inches long and the width of a finger. Why, when faced with an unfamiliar creature, do people often opt to beat it to death? I just don't understand. What I would do? Most likely throw something at the snake then run! ugg snakes, but still that's sad. If it was me I'd run screaming and never enter my house again...i don't like snakes, especially snakes with feet. it loooks like its part alligator...creepy. i think if i woke up to that creature clawing my bedroom, id be paralyzed by fear until i was able to leave the room and tell somebody(but thatd take awhile, cuz im NOT really a fan of darkness, but im not scared either.). it looks like it ate something, and it's leg poked through. but I want it to be real. maybe it's the missing link between lizards and snakes. have you seen those x-rays of snakes, and you can see tiny leg bones inside the skin? ok, its eather a mutant or a new species man kind has yet to discover. I would have kept it as a pet! Ewwwww O_o That is sssooooo weird. "Why, when faced with an unfamiliar creature, do people often opt to beat it to death?" Probably she just freaked out. I would. I'm not saying what she did was good, btw, just that she probably wasn't thinking quite rationally. Oh, poor snake. I have a corn snake of my own whom I love, and while I would not be wild about discovering a strange snake in my house with a leg? Why bludgeon it to death?!!? Sorry kristen, but im dying for kiki 3 i understand it will take time, but do u think you will finish by the end of the year? I'd kill it. No reason to lie either. I'm scared of snakes. I'd feel bad though, but that that sucker would be squashed, shot or stabbed. I'd coer it with a cardboard box. That snake was probably more scared than the old lady. Everybody needs to learn enough science and stuff to realize that WEIRD = COOL. It might NOT have been a freaky cool mutant snake. Snakes are known to swallow pretty big things, and not always finish killing them first. This could very well be a snake that's eaten a lizard and the lizard's leg has somehow poked through the stomach and all the way out. It can happen. That's a little less sad, because the poor snake obviously wouldn't have been long for this world with a hole in its side, plus the lady wouldn't have killed an amazingly cool mutant that might have been a boon to science. that snake just didn't get the full curse i guess imagine if the snake hadn't tempted eve everything would be perfect and it would never rain. That lady totally overreacted. He was so cool, and the snake might've started a whole new breed of animal. I WANT TO NAME IT! The breed will be called... PLEASE INSERT ANOTHER TWENTY FIVE CENTS FOR ANOTHER FIVE LINES. to storm: since when did a snake with a leg have anything to do with religion??? What did you like see him at church or something?